The European Southern Observatory (ESO) conducted deep observations of the the universe using the MUSE spectrograph on its Very Large Telescope (VLT) in Chile. The observations revealed large numbers of atomic hydrogen coating distant galaxies. Direct observations were possible because the MUSE instrument is extremely sensitive. Based on their findings, scientists now believe dim clouds of hydrogen across the sky are glowing with Lyman-alpha emissions from the early universe. The research suggests the whole night sky is invisibly aglow. The international team using the MUSE spectrograph discovered this unexpected dominance of the Lyman-alpha emission in the Hubble Ultra Deep Field (HUDF) region. Astronomers have for a long time debated various sky views on different wavelengths, but the glowing universe as observed by the Lyman-alpha emission was a great surprise to them. “Realizing that the whole sky glows in optical when observing the Lyman-alpha emission from distant clouds of hydrogen was a literally eye-opening surprise,” team member Kasper Borello Schmidt said in a statement. The HUDF region that was observed by the team is located in the constellation of Fornax (the “Furnance”), which was mapped by the NASA/ESA Hubble Space Telescope in 2004. At the time, Hubble had spent more than 270 hours observing deep space. Those observations revealed thousands of new galaxies scattered around the dark patch across the sky. 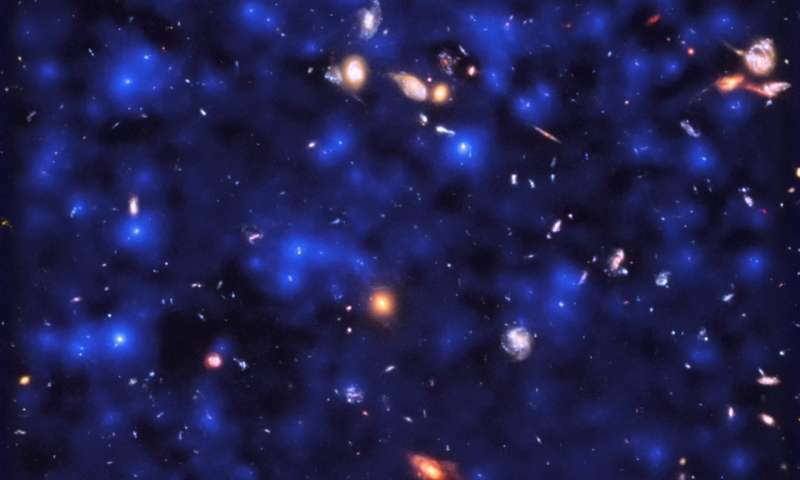 Astronomers believe those galaxies can be used to approximate the scale of the known universe. The MUSE spectrograph allowed them to look even deeper and see the faintly glowing universe caused by remnants of the earlier galaxies. The MUSE instrument is installed on Unit Telescope 4 of the VLT at ESO’s Paranal Observatory. When it is used to examine the sky, astronomers see a large distribution of wavelengths hitting each pixel of the detector. When looking at the full spectrum of lights from astronomical objects, they can see a deep view of the physical processes that happen in the universe. “With these MUSE observations, we get a completely new view on the diffuse gas ‘cocoons’ that surround galaxies in the early Universe,” team member Philipp Richter said.